A church in Wisconsin has sparked nationwide outrage over its plans to hold a "Pig Rassle" contest this coming Sunday, which, as the name implies, involves chasing down and tackling pigs, just for the fun of it. 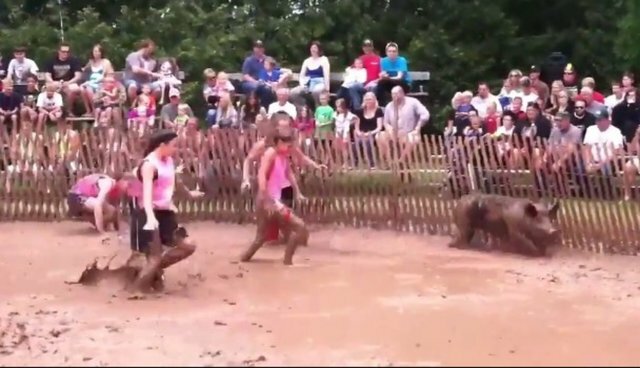 Video from last year's event depicts a group of young people jostling in a mud-filled ring while a terrified pig desperately tries to avoid them. The objective is to subdue the animal and lift him into a barrel. So far, more than 40 thousand signatures have been added to a Change.org petition launched by the Global Conservation Group which states that pigs forced into the ring are "punched in the face, kicked, body-slammed, jumped on, yelled at and thrown into a bucket." Such treatment, it argues, is on par with cockfighting and dogfighting --- illegal activities considered "Crimes Against Animals" in the state. Local authorities in the close-knit community of roughly 2,700 residents say they have no plans to intervene in the Church's activities, but as pressure from protesters continues to mount and lawmakers take notice, inaction may no longer be an option.